This vacation, select a home, townhouse, condo or villa from Melbourne Beach vacation rentals. The accomodations are economical and offer great comfort as your "home away from home." Pamper yourself this year and forget the motels, hotels and cramped quarters. Whether you've come to Melbourne Beach to winter and visit old friends and relatives or looking for a central spot from which to tour Florida, you'll find perfect accommodations at Melbourne Beach vacation rentals. Locations here are also in close proximity to Archie Carr National Wildlife Refuge, one of the most important Sea Turtle nesting sites in the world. 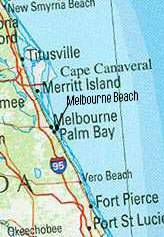 Melbourne Beach and Melbourne are just south of Titusville and the nation's Space Center. From here space launches can easily be seen during the day or night and probably from your Melbourne Beach vacation rentals. For the tourist there are museums, preserves and eco parks along the coast as well as an abundance of water activities because of the Melbourne Beach location between the Intracoastal waterway and the Atlantic Ocean. Like many Florida east coast cities, only the Intracoastal waterway separates the beach community from it's namesake. A trip into the Orlando area and the major theme parks of that area is only about an hour's drive.